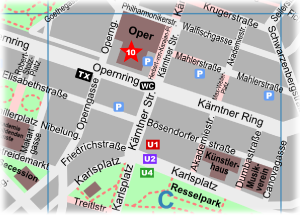 Opening hours: The ticket sale in the arcades at the Herbert von Karajan Platz opens Monday to Friday from 9.00 o'clock and closes one hour before the beginning of the performance. Saturday it's open from 9.00 - 17.00 o'clock . At Sundays and public holidays it's closed. Tip: Admire the pompous rooms of the opera building during a guided tour. The tours lasts about 40 minutes and costs approx. 9 Euro. Details available further below. The Vienna Opera House (C1) is not only the -first house at the Ring- and therefore also the most impressive building at the Ringstrasse but also a worldwide known opera house. At 1709 seats and 567 standing-rooms the audience can watch daily opera performances, ballet shows, sometimes concerts and one time a year an operetta - that is the -Fledermaus- as traditional New Year's Eve performance. Worldwide known are also the Wiener Philharmoniker. Each musician of the Vienna Philharmonic Orchestra is exclusively selected and has to be member of the opera orchestra. A membership there for some years is a requirement for the entry to the -Wiener Philharmoniker-. Their traditional New Year's concert is performed in the -Musikvereinssaal- and broadcast from there in more than 70 countries. Not less popular is the Vienna Opera Ball, which is visited by VIPs from all over the world, especially artists and popular people from economy and politics. At the last Thursday in the Carnival the house transforms into a magnificent ballroom for more than 5000 visitors. Rich flower decorations, the dress code (tailcoat only for man and evening dress for woman is obliged) and the glamorous opening performed by the young ladies and gentlemen make this ball in Vienna to a very important event of the High Society. Already the opening of the opera house in May 1869 was done by the very famous empress Elisabeth and emperor Franz Joseph. At that evening the premier of -Don Juan- composed by Wolfgang Amadeus Mozart, was performed. The both responsible architects, August von Sicardsburg and Eduard von der Nüll, were no more alive at this time. Just around one year before Sicardsburg died because of a stroke and after wards Eduard Nüll, who was responsible for the interior design, committed suicide. The opera house had great successes under the leading of the director Gustav Mahler. Unfortunately this was followed by a bad period during the World War II. The Nazi regime prohibited several performances, ensemble members were chased away or sometimes murdered. A bomb hit damaged the building heavily in 1945 and the reconstruction took 10 years. At the graceful new opening Beethovens -Fidelio- was performed. Only the front at the Ringstrasse with the facade in the Renaissance arch style including the main entrance, stairs -Feststiege- and the -Schwind-Folyer- in the first floor were not damaged by the bomb hit and give you an impression about the original historicism style of this building. Also the tea salon is located in the historical tract and connects the -Feststiege- with the middle lodge. This splendor room was originally only for visitors from the imperial court, today it is used for important events like state visits during the breaks. For approx. 9 Euro you can attend a guided tour which lasts around 40 minutes. This is a cheap possibility to walk over the marble stairs and to have a look to the middle loge. Usually there are at least 2 guided tours per day which are held in different languages. The schedule is available at the homepage (link below) under the menu -your visit-. The tickets are sold directly in the foyer. At the guided tour you have also a chance to get close to the stage where popular opera singers like Maria Callas, Anna Netrebko, Luciano Pavarotti and Placido Domingo have already performed. You can have also a close look at the conductor's stand which was also used by the famous conductor Herbert von Karajan (he was also the director from 1956 to 1964).